Today it's the day. Google once again showing us the way it heads at the Google I/O. Under the Alphabet label now, it has been a distracting ride so far. 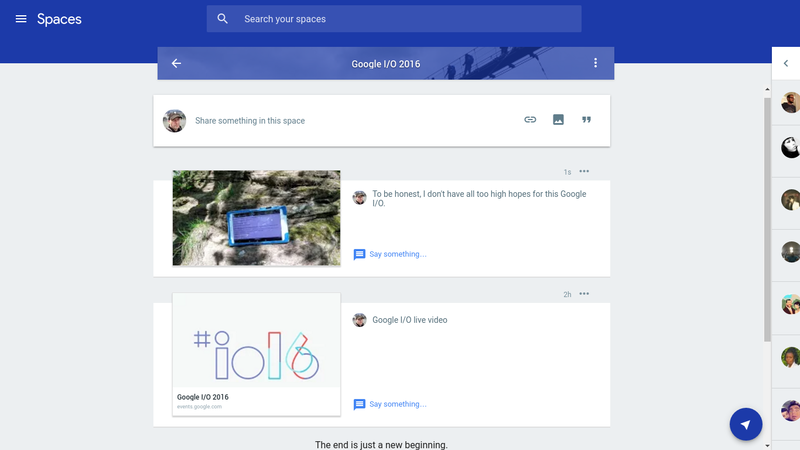 And with the reason introducing to "Google Spaces", it just might go on like that. The question is will we see more of these redundant services, splattering all over the place. Recently it felt like if a product needs improvement, Google comes up with just another service. If there is a plan, Google should quickly tell us about. At the moment i feels like a Asylum for ideas from geniuses and no evolving anymore. Features that Google requests for ages in Google+ comments? Now available in Spaces. A totally new product. And not enough, it has a chat feature. Well, what was about Hangouts and the audio message? Well every major messenger has this feature now, except Hangouts. End-2-end encryption? Nope. Now that could be announced today, right? RIGHT? I mean at the moment is one of the most insecure service for your chat, after even WhatsApp turned full end-2-end encryption. Google must follow now. But I'm frustrated. Yes, I lost my faith in Google. They make illogical decisions at the moment. Even if there is a master plan, it is harmful that people are not getting informed. So what is to be expected from the I/O this year? -> The real name of the Doctor... umm I mean of Android N.
Yeah, you know that is probably the most exiting thing :). Speculation will end. Very likely...one of the projects that gives me question marks in my eyes. Do really think someone that mass market is ready for it? Just when the world goes mobile? Okay, I wanted this 20 years ago, now it's no longer relevant to me. No. This would be very unlikely. It's too early. However it would be awesome. They better give a hell of a demonstration. Right now I'm rubbing my eyeballs. Why? Google Docs, Hangouts,Google+ light. This is interesting. Google's answer to Amazon Echo. Bring it on. NOW and in all major countries right away. Seriously, I'm going to wait for something unexpected. Just like it was in recent years. I sound very skeptical this time. But the last Google-Year I was disappointed extremely. Let's do it better from now on Google, will ya?